A quick and easy vegan lunch your kids will eat…. However, store bought veggie burgers would work fine for this if you don’t feel like making them from scratch. 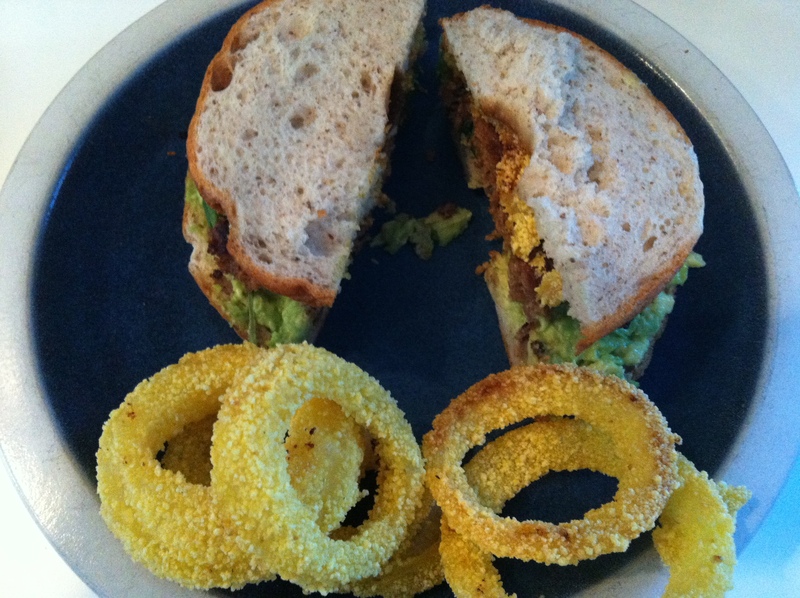 I then toasted Gluten Free bread and sliced avocados and put them on the burgers. One boy loves spicy miso on his, the other kids prefer “no sauce.” I put the whole meal into the category of jaw dropping amazing, by serving it with Ian’s gluten free onion rings. It looked and tasted like comfort food, and while you wouldn’t want to make the onion rings an everyday thing they are a very good treat. The whole meal probably took 10 minutes to make….It was a good reminder that sometimes a healthy meal can be assembled rather than chopped, blended and marinaded…. Previous postWhat is awake parenting? Next postI am so over winter…..